Each and every cat has its own personality and even cats from the same litter can be quite the opposite in character. The British Blue has quite a distinct personality and if you own one or are thinking of getting one then read on to find out a bit more about their personality. A British Shorthair can be independent and reserved but can also surprise you by acting like a little kitten - but only for a while, they do like to keep their dignity. Dignity is very important to a British Shorthair. They do not use their voice like most breeds do. A British Shorthair will only use its voice when it is necessary and appropriate - when they are out of food or in danger, for example. They appreciate the company of people but cannot be described as lap-cats. They like people to be around but not too overwhelming and still they seem to be able to draw all the attention they need - probably as they are so 'pretty'. They are extremely smart and they do almost anything for a treat, as long as they do not loose their dignity, of course. 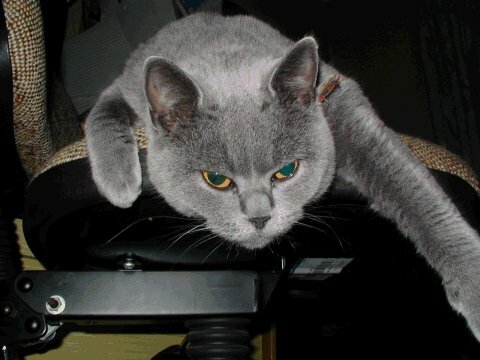 British Shorthairs are very brave cats and aren't afraid of anything. They do like their 'own people' very much and they don't mind strangers being around, as long as they only admire them from a distance and do not try to touch! It takes a while before a British Blue knows you well enough to accept stroking and petting. They do not always run away, they just ignore you and look the other way, and as soon as you stop petting them, they will start cleaning their coats to remove all unwanted germs! We have found all of these traits very true of a British Blue - see our cats but they are very loyal, loving cats once they get to know you.